Culms: Erect to ascending, slender, solid, unbranched, compressed, glabrous to rough or minutely hairy; usually with 1 node above basally clustered leaves. Blades: Occur principally near base; folded to flat, erect, thick, linear, .8 to 3.2 inches long, less than 1/12 inch wide, soft-hairy; margins conspicuously thick, whitish; midrib thickened, whitish below; tips abruptly pointed to blunt. Sheaths: Shorter than internodes, keeled, often soft-hairy at collar; margins finely fringed. Ligules: Fringe of very short hairs. 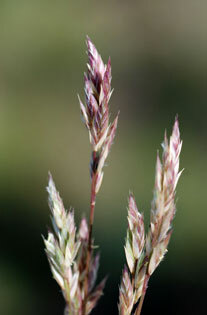 Inflorescences: Panicle, short, contracted, .2 to 1.6 inches long, .6 to .8 inch broad, pale to purplish; branches few, short, 3-4 spikelets per branch. Habitat: Pastures, prairies, disturbed sites, rocky hills, and roadsides; dry gravelly, sandy or rocky soil. Forage Value: Poor forage for livestock and wildlife. Comments: The tufts tend to pull up easily.